Fragile is the fourth studio album by English progressive rock band Yes, released in November 1971 by Atlantic Records. Following the success of their tour to support their previous album, The Yes Album (1971), the band regrouped in London to work on a follow-up. Early into the sessions, keyboardist Tony Kaye was fired over his reluctance to learn more synthesisers and was replaced with Rick Wakeman of the Strawbs, whose experience with a wider range of keyboards expanded the group's sound. Four tracks on Fragile are group compositions; the remaining five are solo pieces written by each member. Its cover is the band's first designed by Roger Dean, who would design many of their covers and stage sets. Fragile received a positive reception upon its release and was a commercial and critical success, reaching number 4 on the US Billboard Top LPs chart and number 7 on the UK Albums Chart. Yes released an edited version of "Roundabout" as the album's single in the US which reached number 13, and remains one of the band's best known songs. Fragile is certified 2× platinum by the Recording Industry Association of America for selling over two million copies in the US. It has been remastered several times since its release, some containing previously unreleased tracks. Fragile was the band's first album to feature keyboardist Rick Wakeman, pictured here in 2012. On 31 July 1971, Yes performed the final concert of their 1970–71 tour at Crystal Palace Park, London in support of their previous album, The Yes Album (1971). The tour was significant for the band as it included their first set of gigs in the US which helped them gain momentum as The Yes Album and its single "Your Move" reached the US top 40. The line-up during this time consisted of lead vocalist Jon Anderson, bassist Chris Squire, drummer Bill Bruford, keyboardist Tony Kaye, and guitarist Steve Howe. Following the tour, Yes started work on their next studio album that was originally conceived as a double album with a combination of studio and live tracks. The concept could not be realised due to the increased amount of time required to make it. Ideas to record in Miami, Florida with producer Tom Dowd also never came to fruition. Rehearsals took place in August 1971 in what Squire described as "a little rehearsal studio in Shepherd's Market" in London. As recording began, Kaye was reluctant to expand his sound beyond his Hammond organ and piano and play newer instruments like the Mellotron or Moog synthesizer, causing artistic disagreements with his bandmates, particularly Anderson and Squire. Kaye was soon sacked from Yes, and a replacement was quickly found in Rick Wakeman, a classically-trained pianist with experience playing a wide variety of keyboard instruments who was a member of the folk rock band Strawbs and an in-demand session musician. Wakeman was offered a spot with David Bowie's touring band on the same day that he was asked to join Yes, and he chose to join Yes due to the opportunity for more artistic freedom. He joined the group as they rehearsed "Heart of the Sunrise". Squire spoke about that first session: "That marked the first real appearance of the Mellotron and the Moog—adding the flavour of those instruments to a piece we'd basically already worked out". According to Wakeman, the basic structure of "Roundabout" was also worked out on the same day. Recording for the album took place in September 1971 at Advision Studios using a 16-track tape machine. Eddy Offord, who served as a recording engineer on Time and a Word (1970), assumed his role while sharing production duties with the band. Rolling Stone reported the album cost $30,000 to produce. According to Michael Tait, the band's lighting director, the album's title came from their manager Brian Lane who, while on the phone to "some press guy" asking Lane about the new album, "was looking at some photos from that Crystal Palace gig, saw the monitors at the front of the stage and, like all equipment, they had 'Fragile' stamped on the back". Bruford claimed he in fact suggested the title because he thought the band "was breakable" at the time. While the band were recording, Wakeman remembered children being brought into the studio to watch them play. Fragile is formed of nine tracks; four are "group arranged and performed" with the remaining five being "the individual ideas, personally arranged and organised" by the five members. [nb 1] Squire reasoned this approach was necessary in part to save time and reduce studio costs, as money was used to purchase keyboard equipment for Wakeman. According to Bruford: "There was this endless discussion about how the band could be used ... I felt we could use all five musicians differently ... So I said—brightly—'Why don't we do some individual things, whereby we all use the group for our own musical fantasy? I'll be the director, conductor, and maestro for the day, then you do your track, and so on.'" Wakeman commented on the album's structure. "Some critics thought this was just being flash. The thinking behind this was that we realised there would be a lot of new listeners coming to the band. They could find out where each individual player's contribution lay." Side one begins with "Roundabout", a song written by Anderson and Howe that has become one of Yes's best-known songs. Howe recalled the track was originally "a guitar instrumental suite ... I sort of write a song without a song. All the ingredients are there—all that's missing is the song. 'Roundabout' was a bit like that; there was a structure, a melody and a few lines." The introduction was made by recording a piano note played backwards. "Cans and Brahms" is Wakeman's adaptation of the third movement of Symphony No. 4 in E minor by Johannes Brahms, with an electric piano used for the string section, grand piano for the woodwinds, organ for the brass, electric harpsichord for reeds, and synthesizer as contrabassoon. [nb 1] Wakeman later described the track as "dreadful", as contractual problems with A&M Records, whom he was with as a solo artist, prevented him from writing a composition of his own. [nb 2] Anderson described "We Have Heaven" as a "rolling idea of voices and things", with its two main sets of chants containing the phrases "Tell the Moon dog, tell the March hare" and "He is here, to look around" (cf.). Side one closes with "South Side of the Sky". Side two of the album opens with Bruford's track, "Five Per Cent for Nothing". With a running time of thirty-five seconds, it is his "first attempt at composition—but we've all got to start somewhere". According to Tait, its original title was "Suddenly It's Wednesday", but it was changed in reference to Yes paying off their former manager Roy Flynn with the deal of five percent of future royalties. "Long Distance Runaround" segues into Squire's solo track, "The Fish (Schindleria Praematurus)". Tait recalled Anderson called him "at ten o'clock one night from Advision and said, 'I want the name of prehistoric fish in eight syllables. Call me back in half an hour'". Tait subsequently found Schindleria praematurus, a species of marine fish, in a copy of Guinness Book of Records. Howe performs his solo guitar piece "Mood for a Day" on a Conde flamenco guitar. "Heart of the Sunrise" is a track where Wakeman's classically trained background came into play; he introduced the band to the idea of recapitulation where previous segments in music are revisited. Fragile was also the first Yes album to feature cover art from Roger Dean, pictured here in 2008. 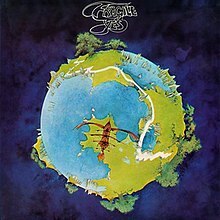 The album's sleeve was designed and illustrated by English artist Roger Dean, who would design many of Yes's future album covers, including their "bubble" logo. On reflection of the design, Dean said: "'Fragile' was very literal, really. I think the band has named a number of their albums after their current psychological state, and 'Fragile' described the psyche of the band. And I thought about that very literally, painting a fragile world that would eventually break up." He commented further: "'Fragile' was quite a complicated cover because there was a book inside. It was elaborate although it wasn't one of the most striking of all the Yes covers. I was kind of learning my trade at the time. The main feature on the cover was a little Bonsai world with a wooden space ship flying overhead! It was literally meant to be a fragile world". The band had wished for an image of a fractured piece of porcelain; to compromise, Dean ended up breaking the planet into two pieces. This idea of a broken world would continue on the band's live album, Yessongs. Bruford thought Dean "brilliantly parlayed that idea [one of Fragile] up to the prescient image of the fragile planet earth, with implications of a delicate and breakable eco-system". Fragile was released in the UK in November 1971 followed by its US release on 4 January 1972. It was originally set for release in the latter around the same time, but delays in printing the cover led to its release pushed back. It peaked at number 4 on the U.S. Billboard Top LPs chart and number 7 in the UK. "Roundabout" was released as a single in the US with a duration of 3:27, with "Long Distance Runaround" on the B-side. It peaked at No. 13 on the Billboard Pop Singles chart in April 1972. In April 1972, Fragile was certified gold by the Recording Industry Association of America (RIAA). The album is certified double Platinum by the RIAA for over 2 million copies sold. The album has been certified Silver by the British Phonographic Industry. Fragile received a mostly positive reception upon its release. Billboard magazine selected the album in its "Billboard Pick" feature, describing it as "vibrant, soothing, tumultuous, placid and instrumentally brilliant" and Anderson's vocals "deliciously ingratiating". In his review for Rolling Stone, Richard Cromelin pointed out the album's "gorgeous melodies, intelligent, carefully crafted, constantly surprising arrangements, concise and energetic performances" and "cryptic but evocative lyrics", but pointed out that Yes "tend to succumb to the show-off syndrome. Their music (notably "Cans and Brahms" and "We Have Heaven") often seems designed only to impress and tries too hard to call attention to itself". Kurt White reviewed the album in The Daily Reporter, calling Wakeman a "very talented organist". He named "Roundabout" the album's finest cut, "an eight-minute masterpiece incorporating unusual rhythm and music". He notes that despite its "limitations and faults", Fragile remains "interesting and enjoyable". Melody Maker gave a mixed review on 20 November 1971. It opened with: "'Fragile' does not seem to go anywhere or have any theme except displaying Yes' technical ability ... It's not until 'Heart of the Sunrise' that they get there. It's all a little too much like exercises, clever and beautifully played". The review praised "Roundabout" for Howe's guitar work and compared its style to "Yours is No Disgrace" from The Yes Album. In the Detroit Free Press, reviewer Jon Weisman deemed it "in a word, extraordinary" with Wakeman's addition to the band the key to them achieving an "ethereal, clear sound" they had been aiming for. His main criticism was the band's tendency to be too esoteric in their style and "other-worldly". Ed Keheller for Circus magazine summarised his review of the album with "Fragile is unquestionably their most cohesive and mettlesome undertaking". In the same issue, Squire responded to the criticism regarding the album's solo tracks, "in a way you've got to appreciate the circumstances. We had to get another album out quickly from a purely financial point of view. We have a lot of mouths to feed. Rick ... had to buy a vast amount of new equipment when he joined, and it all costs much more money than people seem to imagine." In 2005, Fragile was included in the musical reference publication 1001 Albums You Must Hear Before You Die. In his review for AllMusic, Bruce Eder gave the album five stars out of five. He writes: "Fragile was Yes' breakthrough album, propelling them in a matter of weeks from a cult act to an international phenomenon; not coincidentally, it also marked the point where all of the elements of the music (and more) that would define their success for more than a decade fell into place fully formed. The science-fiction and fantasy elements that had driven the more successful songs on ... The Yes Album, were pushed much harder here, and not just in the music but in the packaging of the album: the Roger Dean-designed cover was itself a fascinating creation that seemed to relate to the music and drew the purchaser's attention in a manner that few records since the heyday of the psychedelic era could match." In 2014, readers of Rhythm voted it the sixth greatest drumming album in the history of progressive rock. In 2006, two new "audiophile" remasters were released. Mobile Fidelity Sound Lab put out a "24 KT Gold" edition for CD headed by Shawn Britton,[nb 7] and a 200-gram LP from Analogue Productions by Kevin Gray and Steve Hoffman. [nb 8] Warner Japan released Fragile in 2011 in a hybrid stereo/multi-channel edition for the Super Audio CD format as part of their Warner Premium Sound series. [nb 9] The 2003 reissue was included in the album box set The Studio Albums, 1969–1987, released in 2013. Fragile was released in a new stereo and 5.1 surround sound mix on CD, DVD-Audio, and Blu-ray by Steven Wilson, on 30 October 2015. The Blu-ray disc features six previously unreleased tracks. ^ Wakeman also claimed to have made writing contributions to "South Side of the Sky" and "Heart of the Sunrise" by adding piano interludes, but did not receive credit because of the contract disputes. He was promised more money by executives at Atlantic Records, but claims he never received it. ^ Several seconds after "Heart of the Sunrise" is a reprise of "We Have Heaven" that begins with the sound of a door being unlatched ("We Have Heaven" ends with the sound of a slamming door). This hidden track is not listed on the album's sleeve. Original pressings list the duration of "Heart of the Sunrise" as 10:34, thereby omitting the timing of the reprise. ^ a b c Cromelin, Richard (16 March 1972). "Yes Fragile > Album Review". Rolling Stone (104). Archived from the original on 1 October 2007. Retrieved 22 July 2007. ^ "Classic Rock's Second Best Albums". Ultimate Classic Rock. 14 December 2017. Retrieved 23 April 2019. ^ a b AMG Overview – Yes Fragile at AllMusic. Retrieved 18 August 2014. ^ "Rick Wakeman's piano journey into Yes, Bowie". newsweek.com. 8 March 2017. Retrieved 10 April 2018. ^ "Yes - Fragile 45th Anniversary- Jon Anderson, Rick Wakeman". In the Studio with Redbeard. Archived from the original on 28 October 2017. Retrieved 23 April 2019. ^ Turner, Steve (30 March 1972). "The Great Yes Technique Debate". Rolling Stone. ^ Rowe, Jeri (23 April 2004). 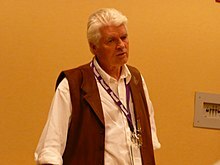 "Roger Dean: The artist behind the music". Greensboro News-Record. ^ Campbell, Mary (17 July 1973). "Wakeman's 'Six Wives of Henry VIII' a hit". York Daily Record. p. 30. Retrieved 6 January 2016 – via Newspapers.com. ^ Billboard albums chart info – Yes Fragile at AllMusic. Retrieved 16 September 2011. ^ "UK chart history – Yes Fragile". www.chartstats.com. Retrieved 16 September 2011. ^ "Yes > Charts & Awards > Billboard Singles". Allmusic. Retrieved 20 December 2009. ^ "Gold Record Awards". Billboard. 29 April 1972. ^ "American certifications – Yes – Fragile". Recording Industry Association of America. ^ Eder, Bruce. Fragile at AllMusic. Retrieved 6 January 2007. ^ Christgau, Robert (1981). "Consumer Guide '70s: Y". Christgau's Record Guide: Rock Albums of the Seventies. Ticknor & Fields. ISBN 089919026X. Retrieved 9 March 2019 – via robertchristgau.com. ^ Warburg, Jason (2019). "The Daily Vault Music Reviews : Fragile". dailyvault.com. Retrieved 29 January 2019. ^ Dahlen, Chris; Leone, Dominique; Tangari, Joe (8 February 2004). "Pitchfork: Album Reviews: Yes: The Yes Album / Fragile / Close to the Edge / Tales from Topographic Oceans / Relayer / Going for the One / Tormato / Drama / 90125". pitchfork.com. Pitchfork Media. Retrieved 19 January 2008. ^ Lechner, Ernesto (6 February 2003). "Classically Trained!". Rolling Stone (915). p. 64. Archived from the original on 21 April 2009. Retrieved 3 July 2011. Reviews reissues of Yes, Time and a Word, The Yes Album, and Fragile. Posted 15 January 2003. ^ Christgau, Robert (2 March 1972). "Consumer Guide (24)". The Village Voice. Retrieved 16 December 2011. ^ "Billboard Pick: Yes: Fragile". Billboard. 22 January 1972. ^ White, Kurt (29 January 1972). "Records". The Daily Reporter. Dover, Ohio. p. 11 – via Newspapers.com. ^ "Pop Albums: Yes: "Fragile" (Atlantic)". Melody Maker. 20 November 1971. p. 30 – via ProQuest. ^ Weisman, John (23 January 1972). "John Weisman – FRAGILE—Yes". Detroit Free Press. Retrieved 16 December 2017 – via Newspapers.com. ^ "Yes: Fragile". Circus. April 1972. ^ Hopkins, Mary (April 1972). "Yes: Flaws in Fragile". Circus. p. 53. ^ "Peart named most influential prog drummer". TeamRock. 3 October 2014. Retrieved 21 August 2015. ^ "Ask YES – Friday 26th April 2013 – Chris Squire - Yesworld". yesworld.com. Retrieved 10 April 2018. ^ "Dutchcharts.nl – Yes – Fragile" (in Dutch). Hung Medien. ^ "Yes | Artist | Official Charts". UK Albums Chart. ^ "British album certifications – Yes – Fragile". British Phonographic Industry. Select albums in the Format field. Select Silver in the Certification field. Type Fragile in the "Search BPI Awards" field and then press Enter. ^ "American album certifications – Yes – Fragile". Recording Industry Association of America. If necessary, click Advanced, then click Format, then select Album, then click SEARCH. Bruford, Bill (2009). Bill Bruford: The Autobiography: Yes, King Crimson, Earthworks, and More. Jawbone Publishing. ISBN 9781906002237. Hedges, Dan (1982). Yes: An Authorized Biography. Sidgwick & Jackson. ISBN 978-0-283-98751-9. Morse, Tim (1996). Yesstories: "Yes" in Their Own Words. St Martin's Press. ISBN 978-0-312-14453-1. Welch, Chris (2008). Close to the Edge – The Story of Yes. Omnibus Press. ISBN 978-1-84772-132-7. Wooding, Dan (1978). Rick Wakeman: The Caped Crusader. Granada Publishing Limited. ISBN 978-0-709-16487-6. "Owner of a Lonely Heart"
"Love Will Find a Way"
"South Side of the Sky"
Yes: Live – 1975 at Q.P.R. This page was last edited on 23 April 2019, at 16:33 (UTC).